Passive viewing is not in the cards in the massive retrospective Bruce Nauman: Disappearing Acts, on view at both the Museum of Modern Art (until 18 February) and MoMA PS1 (until 25 February). The show draws from Nauman’s 50-year career, with sculpture, photography, videos, neons, sound works, drawings and maquettes. Nauman’s work can be as corporeal as it is cerebral, both mystifying and literal, turning on word-play and ambiguity. 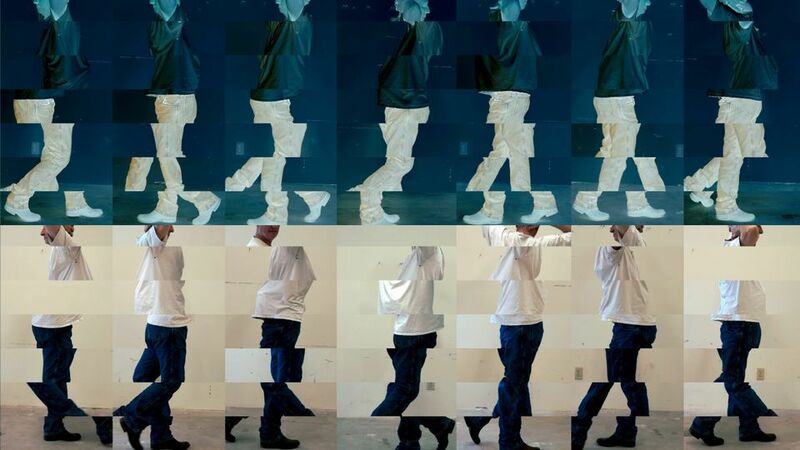 The film Dance or Exercise on the Perimeter of a Square (Square Dance) from 1967-68, shows the artist doing exactly that, repeatedly, on a square he made of masking tape on his studio floor. The large-scale installation Kassel Corridor (1972) takes up a great deal of space without showing the viewer all that much. All that’s visible are the backs of curving walls between which is a corridor far too small to accommodate a human body. Yet a locked door on one side allows viewers who have obtained a key—one per hour—to step inside. You can walk to the end of Nauman’s other narrow, claustrophobic corridors, only to see yourself retreating on a grungy black-and-white video monitor while still moving forward. The faces gazing into the camera in Eugene Richards: the Run-On of Time, an intimate show at the International Center of Photography (ICP) Museum due to close this weekend (20 January), are often frank and seemingly at ease, as if the photographer were someone they knew and trusted. Indeed, in his half-century career, Richards has taken care to treat his subjects as complex characters whose sufferings should inspire empathy. Richards studied photography under Minor White. A turning point came when he joined what was then known as Volunteers in Service to America (Vista), a government programme in which he worked as a health aide in eastern Arkansas in the early 70s as an alternative to being drafted. That led to some haunting photos of locals in straitened circumstances and set him on a path of unflinching documentary photography. Richards goes on to capture gritty residents of his native Dorchester, crack addicts in Red Hook and East New York, a gaunt single mother with a neglectful Chicago landlord and the journey of his first wife from cancer diagnosis to mastectomy to recovery and then relapse. Throughout, the photographs testify to a conviction that issues like poverty, racism, illness and addiction are best understood through a focus on individuals’ life stories. Don some comfortable, rubber-soled shoes and head to the Rubin Museum of Art for a magical experience thanks to the German artist Matti Braun. The exhibition A Lost Future: Matti Braun (until 4 February), part of the museum’s trio of shows on contemporary artists whose work involves Bengal, turns a gallery space into a placid lake through the installation R.T./S.R./V.S. (2003-present). Braun’s piece evokes the lotus pond in the opening scene of the Bengali filmmaker Satayajit Ray’s screenplay for an unrealised film, The Alien. (The story did, however, attract the attention of Hollywood bigwigs like Marlon Brando in the 1960s, and might have influenced Steven Spielberg’s E.T.—another inspiration for Braun—which Spielberg has denied.) The artist has swapped the floating flowers for slices of tree trunks, a variety of shapes and sizes but uniform in height, that poke up out of the water and form paths across its smooth surface. Unlike some alluring but hands-off works, visitors are invited to walk (or hop) across. Though the wood is from local trees, the species, white mulberry and Norway maple, are non-native—in other words, alien.